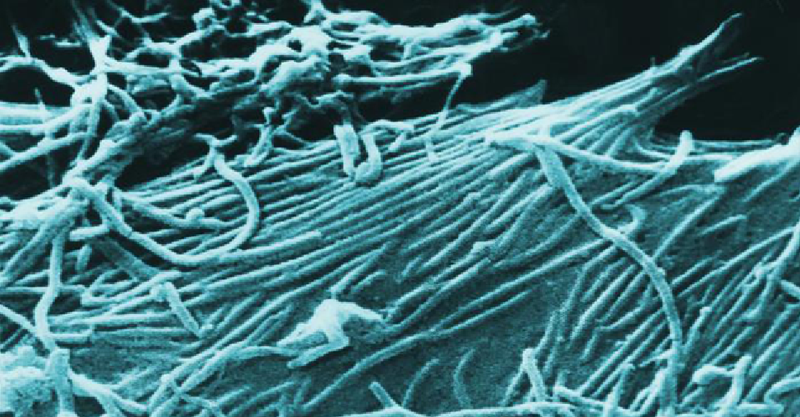 Ebola can evolve quickly to “escape” the antibodies in treatments like ZMapp, but researchers are a step closer to understanding how mutations help the virus resist treatment. Antibodies are proteins that bind with sites on the surface of viruses and bacteria, flagging the infection for destruction by the immune system’s defensive cells. Drugs like MB-003 and ZMapp use several antibodies at once to fight Ebola, but the virus has a way of slipping past them. Researchers at the U.S. Army Medical Research Institute of Infectious Diseases (USAMRIID) studied the genomes of the virus in blood samples from primates which had died of Ebola after being treated with a cocktail of antibodies called MB-003, one of the early formulations that helped researchers develop ZMapp. The team had taken blood samples from the primates at several points during their illness and treatment, because they wanted to look for genetic changes in the virus over time. In particular, they wanted to know whether the virus’ genome had changed in response to the antibody cocktail. The answer was yes. Gustavo Palacios, director of USAMRIID’s Center for Genome Sciences, and his colleagues found clusters of genetic changes in the samples taken after treatment with MB-003. Many of those changes corresponded to the parts of the virus targeted by two of the antibodies in MB-003. According to the researchers, those changes were mutations called “escape variants,” which let the virus evolve to resist antibodies. Ebola mutates rapidly, and during the current outbreak, researchers in many areas have tracked the evolution of the virus through blood samples from patients. Now, Palacios and his team say that antibody cocktails like MB-003 can put ‘selective pressure’ on the virus. When an “escape variant” mutation first shows up, it’s usually just in a small minority of the virus particles in a patient’s body. But when antibodies bind to — and help destroy — the original, non-mutated virus particles, the escape variants survive and multiply. The patient is still infected, but now they have an escape variant of the virus that can block antibody treatments. And it doesn’t take much genetic change to produce an escape variant. Changes in the code for just a few amino acids can protect the virus against multiple antibodies. Palacios and his colleagues say that’s why it’s important for researchers to make sure that the antibodies in cocktails like MB-003 and ZMapp target different areas of the virus. In MB-003, for example, two of the three antibodies in the cocktail target the same region of the protein that helps the virus bind to host cells. That makes it more vulnerable to being defeated by escape variants. The USAMRIID researchers published their results in the journal Cell Reports, and they say their findings could help predict how quickly Ebola can adapt to resist treatments.